Riders and enthusiasts alike will love this hybrid leather motorcycle wallet! Yes, this thin checkbook wallet is the antidote to those thick regular motorcycle wallets or it can be used as an executive checkbook wallet when unchained. Ours' features much more functionality yet is much thinner. This model can hold 20-30 plastic cards. Two discrete billfold sized compartments to enable separation between cash, receipts, checkbook or differing currencies for the travelers. Our special "divide & conquer" design breaks up your cards into 4 discrete areas so they don't all stagger on one long row leaving huge pitched lumps. Our designed breakup into 4 general areas means there will be very nice symmetry when your cards are in place and the wallet is snapped shut so you'll have an even, flattish plane rather than "staggered bulges" like all those other out-dated thick regular checkbook wallets. The coin pocket is on the inside for comfort's sake making the outside line even smoother. Without the chain, it turns into a unisex executive wallet---sleek enough for men's or women's jacket pockets, briefcases, laptop bags or switching to and from purses. And it snaps securely shut. Metal snaps are created extra tight so they stay fit for a long time so unsnap gently and with support for the first month or so until they break in. How's that for a versatile wallet for both men and women? only 1⁄3" (4 mm) thin when closed! There are a lot of perks to this wallet, it's true, so now you're probably wondering about how we managed fit so many innovative design elements into one wallet. It all has to do with the materials we use to make our wallets. This leather motorcycle wallet, like all of Big Skinny's ultra-thin wallets, has a unique ingredient that makes all of the difference. Nylon microfiber. It's the super durable, water-resilient, high-tech fabric with the paper thin thickness. 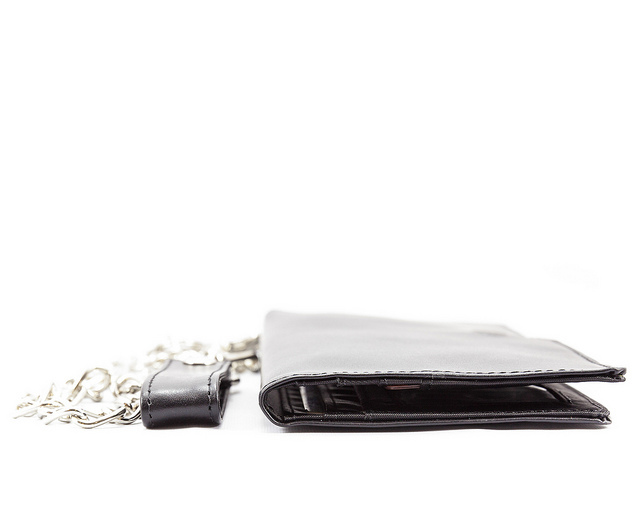 The thinness of this fabric is unlike any other wallet material on the planet. This wallet has nylon microfiber all over the interior pockets to reduce bulkiness. So what about the outside? To combine our two loves, quality and thinness, we decided to use top-grain cowhide leather for this wallet. Like the nylon, it's tough and sturdy but also pleasantly slim and accommodating. A nice glossy finish gives this wallet an amazing look, worthy of any gearhead. We've also added an edgy metal chain to use as a hand strap or as an easy way to clip the wallet onto your belt. 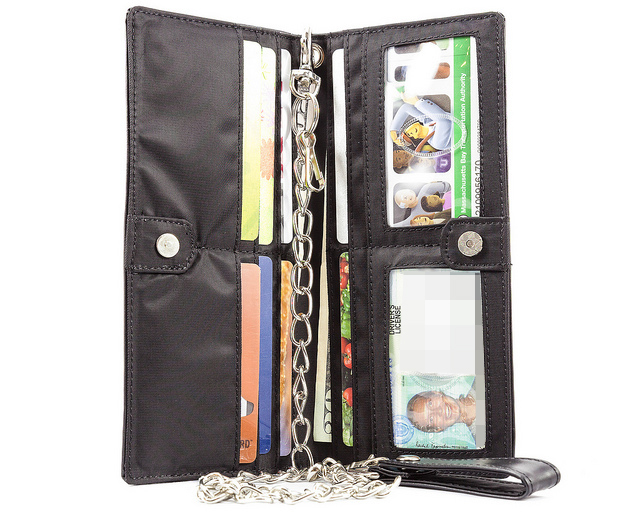 A magnetic single clasp stylishly seals the whole wallet shut, keep your valuables and your ID safely out of sight of prying eyes. Overall, can't really complain considering the price. My only gripe is the money compartments are too tight to hold more than a couple dollar bills. The chain is extremely low quality so I immediately ditched it and made a paracord lanyard. The wallet, itself is yet another example of the excellent design and execution seen in other Big Skinny products. Understanding the pricing constraints, I concur with other reviewers that the chain may be better done. I suggest, eliminating one snap link and using higher quality split rings on each end, in their place. ProsInside of wallet has plenty of slots to put all your credit cards and ID .Wears thin in the back pocket and leather will last for years . Plenty of room, can be worn in front pocket if back one is shallow.Did change out chain, all in all am very satisfied with wallet.Can carry in vest or front pocket due to thinness of design. Prossuper thin and light--I can't say enough about this! ConsI would like an accordion wallet the exact same size as this wallet but with change purse in middle, the ability to hold cards inside along walls and a pocket on either side of change purse for money and receipts. 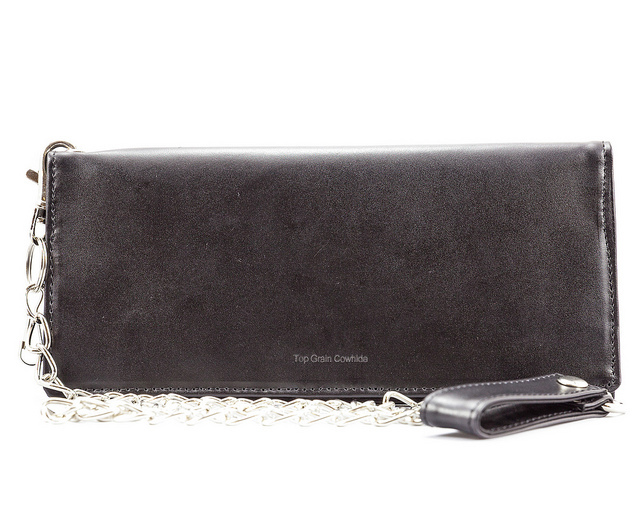 No one makes makes a superthin clutch for men! This is the details of a wallet I bought from you guys several years ago. Mine is worn, I would like to replace it with the same one I bought made by "Big Skinny". Yes, this thin checkbook wallet is the antidote to those thick regular motorcycle wallets or it can be used as an executive checkbook wallet when unchained. Ours' features much more functionality yet is much thinner. This model can hold 20-30 plastic cards. Two discrete billfold sized compartments to enable separation between cash, receipts, checkbook or differing currencies for the travelers. Our special divide & conquer design breaks up your cards into 4 discrete areas so they don't all stagger on one long row leaving huge pitched lumps. Our designed breakup into 4 general areas means there will be very nice symmetry when your cards are in place and the wallet is snapped shut so you have an even, flattish plane rather than staggered bulges like all those other out-dated thick regular checkbook wallets. The coin pocket is on the inside for comfort's sake making the outside line even smoother. 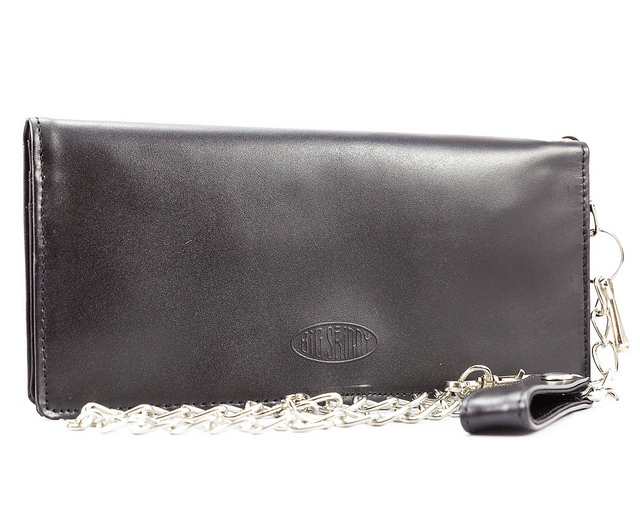 Without the chain, it turns into a unisex executive wallet---sleek enough for men's or women's jacket pockets, briefcases, laptop bags or switching to and from purses. And it snaps securely shut. Metal snaps are created extra tight so they stay fit for a long time so unsnap gently and with support for the first month or so until they break in. How's that for a versatile wallet for both men and women? only (4 mm) thin when closed! Cons(Now): Can't find my wallet anymore! Fits all my cards yet is still comfortable to sit on while I drive. The included chain is a little light for my liking but easily remedied. My husband had a wallet like this 35 years ago while traveling around Europe. It kept his money safe from pickpockets! 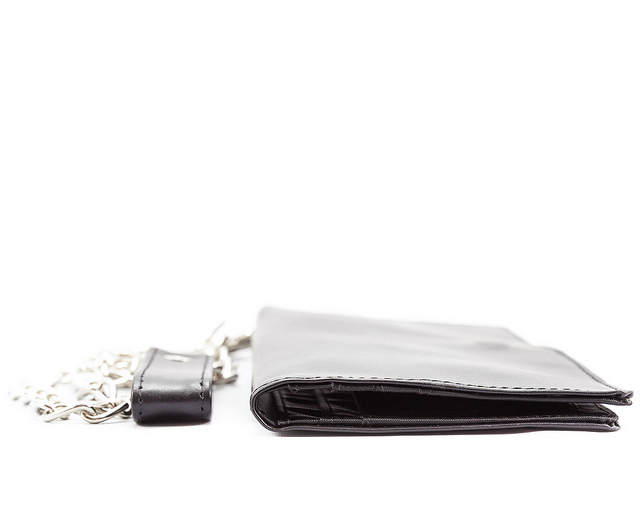 He loves this lightweight wallet and chain for traveling...now to keep from laying his wallet down and forgetting it! ConsCould have had a lighter chain. I love this wallet! Love that I know I won't lose it, and that I can fit everything I have int this wallet!